— Geeks on Tour is member supported. This FREE newsletter is made possible by our paid (Premium) members. Member benefits include access to over 500 tutorial videos, asking questions on ‘Ask the Geeks’ forum, Show Notes for our weekly show, “What Does This Button Do?” and all our eBooks including Mrs Geek’s Guide to Google Photos. Already a member? THANK YOU! To say that we had a full July is an understatement. 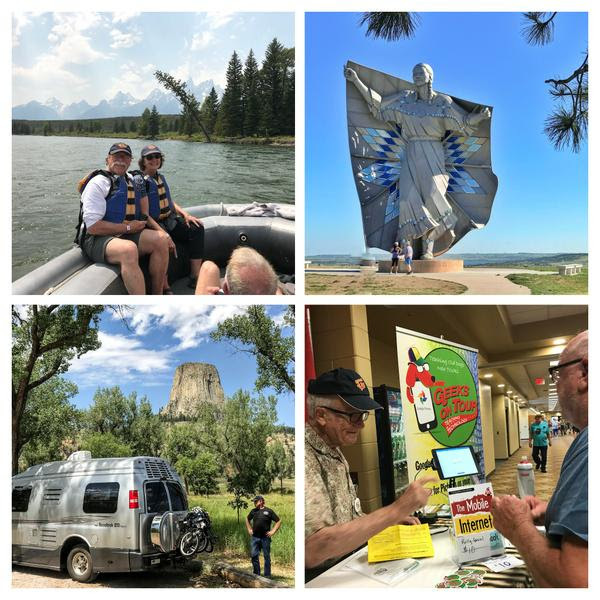 It started on a liveaboard dive trip in the Cayman Islands, then continued back to the RV driving from Michigan to Wyoming for the FMCA rally in Gillette, then we did some sightseeing in Devils Tower, Yellowstone, and Tetons. On the last day of July, we were at our favorite hot springs, the Fountain of Youth RV park in Thermopolis, Wyoming. Our photo album for July is impressive, if I do say so myself! Also see our Map and our Blog for the rest of the story. Watch our next Button show! We are currently in the Denver area and staying at Elks Lodge #2227 in Westminster. The last time we were here was 4 years ago when we webcastEpisode #1 of What Does This Button Do? How exciting, we will do Episode #149tomorrow from this same spot! Sunday, August 5, at 2pm Mountain time, (that’s 1pm Pacific, 3 Central and 4 Eastern time.) Episode 149 will be about things we’ve learned about being in the wilds of Wyoming. How we coped with little or no Internet, and often no electricity either. LIVE! Watch Episode 149 LIVE! We record them in a live stream, normally on Sundays at 2pm at our local time. When we’re not doing our live show, we’ll post an encore episode. Thursday is “Gabbing With the Geeks” on Facebook Live to answer questions from viewers and discuss anything. 5pm our local time. Here’s our speaking request form if you’d like to have us speak to your group. 9/10 – 9/15 Discovery Owners 20th Anniversary Rally in Goshen, IN. 9/26 – 10/3 The RV Travel Club 2018 Grand National Rally in Sevierville, TN. Subscribe to our YouTube Channel for notifications of Live Streams from Geeks On Tour! Be sure to click the little bell to confirm delivery of notifications. ​​​​​​​Like our Facebook Page for notifications to see us Live whenever we like. Here are some of the topics that have been discussed recently. Anyone can read the forum, only members can ask questions. This is a valuable benefit of membership. Join Today! If you are a member, ask a question! Go to GeeksOnTour.com then click the Q&A menu. Make sure you are logged in (there’s a form on the Q&A page), select a category (Photos, Maps, Blogs, Other) then click Add Topic. When finished scroll down to Submit Topic. Do you think you can’t get a good picture of that bald eagle with your smartphone? Take it anyway! You may be surprised at how good you can make it look with just a couple of tweaks from Google Photos editing tools. Most every photo can be improved with a simple crop. It can cut out extraneous items in the photo and get closer to your subject. It can also change the aspect ratio of the photo. 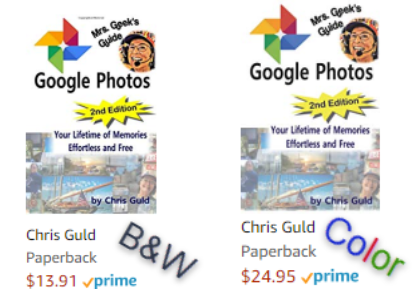 Mrs. Geek’s Guide to Google Photos now available on Amazon. We just spent the last week in some beautiful national parks – Yellowstone and Grand Tetons – there was very little cell service in those parks! We could live with that, we wanted to spend most of our time out doors taking pictures. The distressing thing was how fast my phone’s battery ran down. Guess what?! Do you know about Tioga George? If you’ve been RVing for any length of time, and following other RVers blogs, odds are that you do know George. If not, we want to introduce him to you! Have you learned something from Geeks on Tour? If so, we’d love to get a review from you. Click on this linkthen scroll down until you can click on Write a Review. First you’ll be asked for a rating by stars – 5 is appreciated! Then, please write some comments. Did you learn from us in person? or from videos on our website? Do you watch our weekly What Does This Button Do show? Do you learn from our newsletters? How has your use of technology improved? The Geeks on Tour website is an online learning library for Travelers who want to learn to use their computers and mobile devices for managing digital photos, making blogs, using maps and other online resources. Anyone can get our free weekly tech lesson, read articles on our Computer Tips for Travelers Blog, sign up for our free newsletter. A small fee makes you a ‘member‘ and you can then ask us anything on our Q&A page, view any of our 500+ video tutorials on these subjects in our Learning LIbrary, and get written notes and eBooks of our lessons. Published by MrsGeek, in Newsletter.